Large trade imbalances have political implications and are very often exploited for political gains. This is certainly true of Germany’s gigantic, and controversial, trade surplus, which in 2016 was around €270 billion ($297 billion) or 8.6% of Germany’s annual GDP. But it is Germany’s bilateral trade surplus of $65 billion with the United States that has made the German surplus such a hot political issue, where the rhetoric and blame coming from Washington has particularly increased since Mr Trump stepped into the Oval Office. The US has put Germany, along with Japan, China, South Korea and Taiwan on the watch list of potential currency manipulators under the Trade Facilitation and Enforcement Act (2015). Calling this ‘economic nonsense’ Barry Eichengreen has argued that Germany being a member of the Eurozone has no exchange rate of its own to manipulate, it is relatively open to the US exports and is also subject to the EU anti-subsidy regulations. To Marcel Fratzscher, the reason Germany has sustained its wirtschaftswunder (economic miracle) is by competitiveness through innovation rather than a reliance on the exchange rate. As a counter to the US decision, one can argue that with the dollar being the global reserve currency, the US is bound to run large trade deficits i.e. ‘the Triffin Dilemma’. Figure 1: Current Account Balance as % of GDP 1960 – 2015 Source: OECD (2017). Carmen Reinhart also rightly indicates that the US’ current stance is not unprecedented. Since the 1980s the US has accused first Japan, then China and lately Germany for its own current account deficits. This should not be a surprise when we see the dynamics of trade balances of the accused countries in the last three decades (see Figure 1). Perhaps Germany is just the new ‘scapegoat’ for the ills of the US economy and domestic economic issues. The US being the largest exporter of capital has become the largest importer since 1980s. The real cause of the US mountainous trade deficit is its saving and investment imbalances and its tax policy which favours debt accumulation by households, sacrificing savings, and a slowdown in productivity which has affected US competitiveness. To Hans Werner Sinn, these causes of imbalances are also shared by the Southern European states who have been running huge trade deficits. The solution suggested by Professor Sinn to the US and Southern European states with large deficits is to tighten their belts, whereas Jeffery Sachs suggests the US should address its saving/investment imbalance, and that furthermore, the real explanation of German and Chinese surpluses is neither the manipulation of their currency or discrimination against imports, but the excess of savings over investment and spending on production. 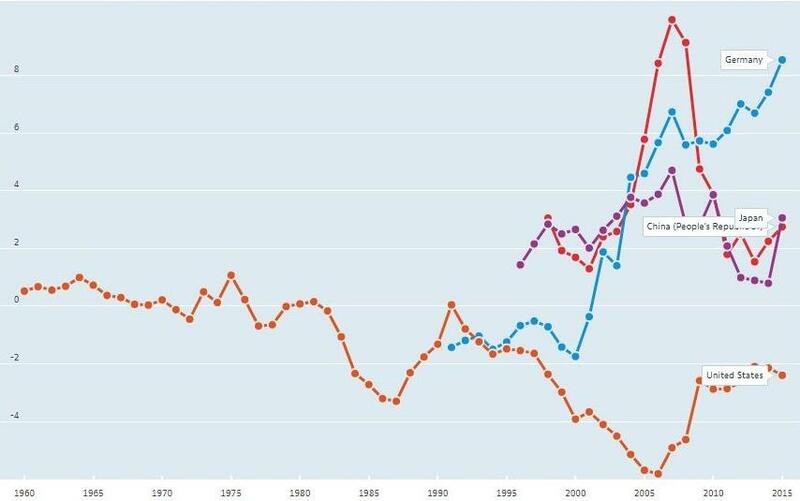 Given that the Chinese trade surplus has lately started to decrease, Germany rightly or wrongly has become the focus of attention and criticism for global imbalances and stagnation, though the empirical evidence does not provide much support to the notion that the exchange rate misalignments are the cause of major global imbalances. In fact, the cause of the German surplus is in part down to high saving rates due to the old-age dependency ratio which in fact will get worse as the Germany approaches ‘silver age’. By 2035 Germany will have more than 21 million inhabitants over the age of 67, half of them will be over 80 by 2050. So the high saving rate is a sensible stance by the German household which is undoubtedly free to make saving and spending decisions. But the question is how to deal with the imbalances built up as the result of excessive saving, and what can be prescribed to Germany so that it can avoid being Trump’s scapegoat and become a ‘real hero’ of the global economy as Dani Rodrik wishes to see. The suggested solutions to Germany for instance from Barry Eichengreen and Marcel Fratzscher have been to increase its public investment in infrastructure, health and education which can increase its productivity, living standards and ameliorate concerns about inequality. As the proponents argue this could also be fruitful for the world economy, as well as achieving domestic gains. There is no doubt there are some serious investment needs in Germany and some remarkable work has been done by the DIW (Deutsches Institut für Wirtschaftsforschung) to reflect on them. However, given the fact that the Germany had a budget surplus of €23.7 billion in 2016 which is less than 10% of its trade surplus (€270 billion), it implies that a balanced budget may just reduce the fraction of the external surplus. Nonetheless, as sums by the DIW staff suggest, the investment needs are in the figures of hundreds of billions of Euros, hence a surplus (public savings) of this size will soon run short. Concomitantly, the surplus, as already noted, is in part due to German household savings which stand at around 10% of GDP so the solution isn’t just to reduce the public savings and increase public spending. Another proposed solution has come from Clemens Fuest who argues that ‘it would probably be easier to boost corporate investment, such as by introducing accelerated depreciation, tax credits to promote research and development, and more generous loss-offset provisions. Indeed, boosting domestic private investment through corporate tax reform seems the best option’. The suggestion found agreement from Professor Sinn who has urged that in order to deal with large deficits, the US and Southern Eurozone countries should have fiscal discipline. However, that is the suggestion to the undisciplined US and Southern European nations not to the well-disciplined Germany. In the absence of any strong global arrangements in the post-Bretton Woods world, these efforts are to be more national than international. Nonetheless, the idea by Clemens Fuest about tax credits is merely a different choice on fiscal stance, to put it simply, it means cutting taxes rather than increasing spending. Concomitantly, the chances are that such a tax break with all its benefits may not be ample to diminish even a fraction of Germany’s gigantic surplus. Reducing the external (trade) imbalance by reducing the internal (budget) imbalance through increased public spending also faces a crucial constraint. Schuldenbremse (‘the debt brake’) or the balanced budget act dictates that the German (federal and state) governments do not have space to run a budget deficit. Hence, in reality, the €23.7 billion budget surplus can neither fulfil the unmet government spending needs nor can it substantially reduce the external surplus. Needless to say that Germany has no currency of its own to appreciate either. In that world, there are two solutions which seem possible. First, to increase the public spending as suggested by Barry Eichengreen and Marcel Fratzscher which can be accompanied by the tax credits proposed by Clemens Fuest, would mean relaxing the conditions requiring a balanced budget. In fact, under Article 109, there is some provision under exceptional circumstances. A lesson of flexibility comes from the UK where Chancellor Philip Hammond has shown some flexibility towards the intention of balancing the budget by 2020. The second solution involves increasing spending by creating fiscal space through the existing arrangements on TARGET2 balances. In this approach, the TARGET2 balances are settled by an adjustment to the monetary base in the EMU. Specifically, it implies that the Eurozone members are granted a right to settle their imbalances against the Euro-system in proportion to their capital key weights. Given the fact that Germany has the largest claim on the TARGET2 balances as well as the lions share of the capital key, it would be the largest recipient of settlements which will provide fiscal space without breaching the law. Ultimately it is Germany’s choice about which route it takes to settle its large trade surplus. However, it would be wise to spend the ‘Stupid German Money’ (as Professor Sinn put it) on Germans rather than either letting it go to subsidise the undisciplined and uncompetitive US and the South European countries, or by bailing-out its own financial institutions afterwards, in the way they did after the global financial crisis. It’s perhaps time that Germany does the world a favour by acting more favourably to herself.